NEW ORLEANS – What happens in Williamstown, Massachusetts doesn’t stay in Williamstown, Massachusetts. In other words, the Purple Valley Classic shook up the most recent NCAA Division III Women’s National Coaches’ Poll that was released Wednesday by the U.S. Track & Field and Cross Country Coaches Association (USTFCCCA). Meet champion MIT remained No. 3 behind No. 1 Johns Hopkins and No. 2 Washington (Mo. ), but it gave the coaches some thought as to whether it should jump a spot. The Engineers made it look easy as they scored just 55 points and put four runners in the top-15. SUNY Geneseo finished third behind MIT and Canadian college McGill, one spot ahead of host Williams. The Knights and Ephs swapped spots as the former went from No. 5 to No. 4 and the latter from No. 4 to No. 5. Williams senior Victoria Kingham and SUNY Geneseo’s Elise Ramirez waged a terrific battle across the 6K tract as Kingham took fifth to Ramirez’s sixth with a two-second cushion. Dickinson earned a hard-fought fifth place at the Purple Valley Classic and was rewarded justly in the poll. The Red Devils soared from No. 16 to No. 8 and received their highest ranking in program history. Sofia Canning led Dickinson with an eighth-place finish overall. Elsewhere in the top-10, Claremont-Mudd-Scripps went from No. 10 to No. 7 and Carleton joins the top-10 for the first time this season at No. 10. The Knights are inches away from their best ranking in program history (Carleton was ninth in 2011) and jumped five spots from Week 2 to Week 3 following a victory at the Roy Griak Invitational. Tufts and Bates dueled at the Super XC Shootout at Pineland Farms this past weekend and opened some eyes. The Jumbos went from No. 26 to No. 17 thanks to their team title and the Bobcats finished a respectable second with four runners in the top-10. 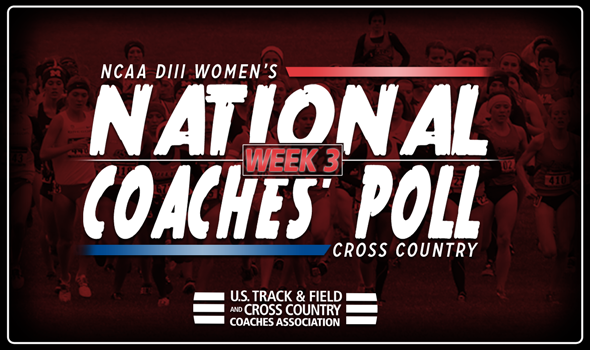 Be sure to check back throughout the season, because you’ll see a lot more movement between now and November 14 when the final NCAA Division III Women’s National Coaches’ Poll is released in advance of the 2017 NCAA Division III Cross Country Championships.